← A most costly mistake! In my last post, I wrote of my ill-fated decision to send Tally away, last year, to be started under saddle. During the four months that Tally was laid up from the injuries sustained at the trainer, we began to get some clues as to the emotional and educational damage that had been done. At the time that I sent her over there, she’d learned to stand quietly to be groomed and fly sprayed. Her lunging skills were good, though she was still getting her balance in canter. She had not been a fan of the saddle, but had finally learned to accept the girth quietly and to pack the saddle around, even lunging over fences, with no objections. I would soon find out that all of these things and more had been lost, and it would take me the better part of a year to retrain her. allowed Tally to squirrel around while being groomed, fly sprayed and tacked up. To her credit, the trainer was very laid back about all of this – but allowing a prey animal whose defense is flight to move their feet while annoyed, nervous or otherwise unhappy actually releases reinforcing chemicals in the brain. After all, their ancestors survived by fleeing, and nature programmed their brain to reinforce that lifesaving behavior. My solution – I had to start over with the “Stand” command I’d taught her before she left. Starting with very short periods, I would reward her for not moving her feet. With each of the issues that caused her to swing about, such as fly spray, I would start with the “Stand” command then start the “procedure”. I would only proceed until I got the sense she was about to break – the first day that meant one squirt of fly spray at a time – and she would receive a reward. For several days, only her front end got sprayed or groomed, because that was as far as I could get without her breaking the “Stand”. As I moved further back, I placed my hand on her chest as support. By this spring, she was not only quiet when tied, through any “procedure”, but she was completely relaxed. Problem – The first time I tried to saddle Tally, after she was home and healed, she swung her head around with a serious threat to bite me. When I buckle a girth, I always start very loose and gradually tighten before we get to work. I had observed the trainer placing the saddle and immediately tightening the girth. As I said, Tally has never been a fan of the girth – so this treatment clearly sent her over the edge! I’ve seen many a horse whose owner takes their safety into their own hands each time they saddle up – but this was the first time for one of my horses. It was rather distressing, after all the time I’d taken to get her accustomed to saddling in the beginning – not to mention the sudden feeling of being treated like an enemy by my horse! I suspect that this problem was not just rooted in annoyance, but also had it’s roots in pain. When she returned, she exhibited significant pain in her back, particularly on the side of her injured hind leg. 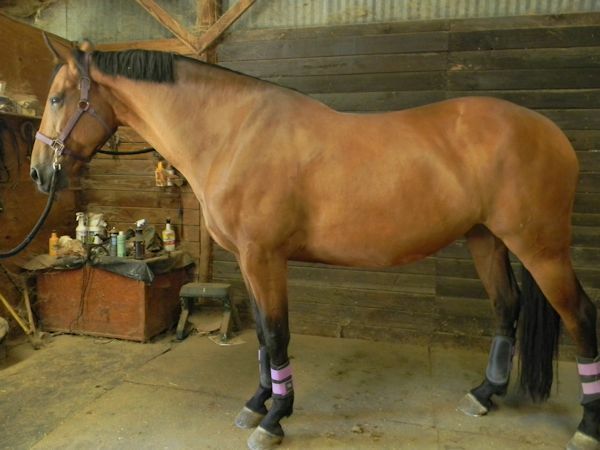 I can imagine that tightening the girth so quickly after saddling was not only irritating, but the sudden pressure of the saddle on a painful back, followed by the added weight of the rider, had created a pain association. My solution – My first step was to leave the saddle off for a couple of months – to buy more time, and to build up the strength in her back. When I decided it was time to tackle the problem, I found the longest girth I could that would still hold the saddle on. I began by buckling it so the girth actually hung just below her sternum. She still tried to bite me, which I met with a slight bump on the nose as a correction. The first time I was able to buckle or tighten the girth without significant reaction, she was rewarded with a carrot bite. In the beginning, each buckle she tolerated was rewarded, gradually expanding the time between rewards as she became more accepting. Today I have no issues with saddling … other than an expectation of a carrot when the girth is tightened. away, as far as her neck would bend. I previously had issues with her height, as it was a challenge to get the headstall over her ears – but she had never balked at taking the bit. In fact, by the time she left, she had learned to lower her lofty head to help me out. I am not sure of the root of her bridling problem, but it seemed a clear sign to me that she “didn’t want to play”. My solution – This was one of the more disheartening issues, because it was completely off-character for Tally – but it was also one of the easiest (and most amusing) to resolve. My first instinct was to pull her head back toward me, or block it from turning in the first place … but I had the sense that she was willing to fight these days, so first I tried an experiment. 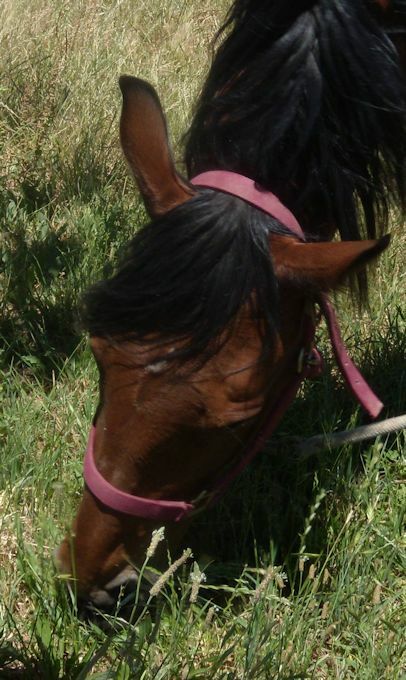 I put the halter around her neck, and she turned her neck into a U, with her head away from me … I did nothing. After some time, she began to wonder what was going on, and she turned back to look at me – she is a highly social horse, and being ignored is worse than any punishment I could invent. I offered the bridle up and she turned away again … so I waited. This repeated one more time before I was able to quietly put the bridle on her head and give her a carrot piece. We’ve gone through this dance many times, but her curiosity always gets the better of her … and if it doesn’t, a little scratching under the jaw (she loves this) is enough to get her to relax and turn back to me. Now, as soon as I place the halter around her neck, she lowers her head into the bridle and takes the bit voluntarily. Problem – Tally had always been a bit of a barger, always too busy watching the world go by to pay attention to whether you were in her path or were being dragged along. I previously spent many hours working on her behavior in this area – but all of that was now lost. From the moment she was at the training facility she forgot that people were at the other end of the lead – and nothing was done to correct it. So, by the time she came home, she was back to dragging us around – and she’s big enough to do it! My solution – I had to halter break her all over again. I began a shaping plan to get her to stop and back up by light pressure backward on the halter. I also expanded the “stand” work to any and every opportunity where it fit – while opening and closing gates, moving poles, or any opportunity where I had time and space to work on her standing with me at a distance. In order to improve her focus on the handler, I also worked on backing up or turning forehand and haunches from light taps with the whip or light touches from the hand. The bonus result from all of this work, beyond more responsive handling, was ever increasing relaxation and less over-alert attention to things in the distance. In fact, I now have a very relaxed mare to handle! reclaiming her attention and manners, but there is no denying that the effort has paid dividends. There is now more trust and bonding than before she left. I’m sharing Tally’s story to show that many equine behavioral issues are not a result of cruel treatment, only thoughtless handling. The trainer who worked with Tally is far from cruel, but she was not aware of what Tally was going through physically or mentally. Her methods might work for some horses, but she did not see the damage they were doing to mine. 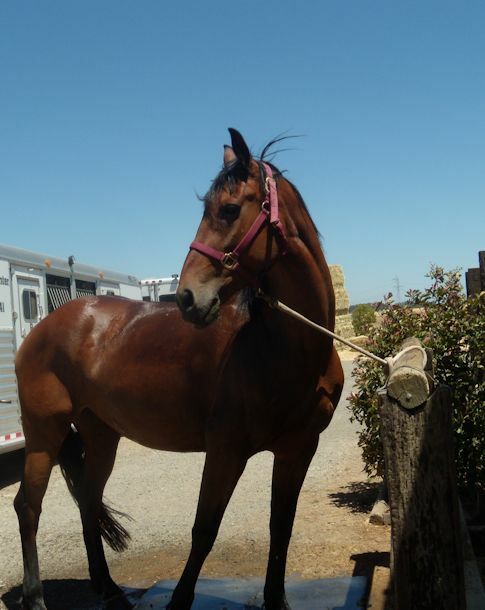 Nor is the root of the problem a bad horse – Tally was not “bad” before she went, and she is back to being a “good girl” after months of rehabilitative work. There is always a root cause to bad behavior that comes from intentional or unintentional training of bad habits. Remember- every time you handle your horse, you are training it, for better or worse! In my next post I’ll cover the more serious challenges we faced in the arena, which I am still working to resolve. Until then … be good to your horse! This entry was posted in My Journey and tagged bridling, horse handling, Horse training, patience, problem solving, saddling, Tally. Bookmark the permalink.